Only our second meeting, but already we felt at home! A few new members joined us this month (huzzah for new faces) many of whom hadn’t had the chance to finish the book. Psychiatrist Andrew Marlowe has a perfectly ordered life–solitary, perhaps, but full of devotion to his profession and the painting hobby he loves. This order is destroyed when renowned painter Robert Oliver attacks a canvas in the National Gallery of Art and becomes his patient. In response, Marlowe finds himself going beyond his own legal and ethical boundaries to understand the secret that torments this genius, a journey that will lead him into the lives of the women closest to Robert Oliver and toward a tragedy at the heart of French Impressionism. Ranging from American museums to the coast of Normandy, from the late nineteenth century to the late twentieth, from young love to last love, THE SWAN THIEVES is a story of obsession, the losses of history, and the power of art to preserve human hope. The Historian was one of those books that left me gasping for more. I loved it and waited with bated breath for another offering from the author. By the time Ms Kostova actually released one, I was too busy to devote the necessary time to reading it. But if it were a book club choice…I’d have to find the time!! This book is a time jumper – set in the present and the past. A thriller of sorts and an homage to impressionism – everything about it should enthrall and delight. 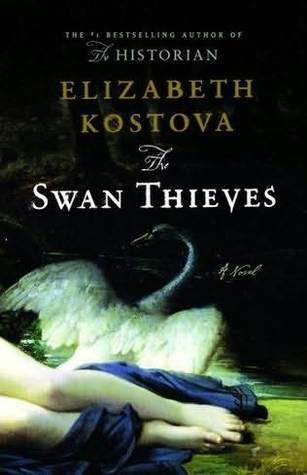 The Swan Thieves is a very easy book to read. The language is fluid and the descriptions used – particularly in relation to the art works referenced – were powerful. Many of us found ourselves poring over the t’interweb to find images of the paintings being described. Indeed it was very disappointing to find that the central painting was fictional. However, it was also just too long – sucking up huge amounts of time. We agreed that if we’d been able to devote a weekend on the beach to it, we’d have probably been less frustrated, but most of us lost momentum along the way. It’s not as though it was a mammoth book for a reason; the editor had clearly skipped out for a cig. It’s a lot like a Dan Brown but without that vital hook that makes it so interesting. For such a big book; the characters are surprisingly thin. Robert Oliver was a shadow of a man – silent only because with two sentences there would have been no need for the book – the plot was not the most complex ever. The psychologist was (for me) the biggest let down. He seemed to be an ethics free zone. Marlowe was also apparently incapable of meeting a woman without fancying her. From the ticket seller in the art gallery, to Oliver’s wife and mistress, Andrew Marlowe can’t seem to stop himself from perving. Rather than make him appear lonely – which we thought was probably the intention – he just seemed a bit two dimensional – so different from the rich characterisation present in her former novel. And all of them were pretentious to the point of pain. Nothing is a simple task – every action is portentous and meaningful. The dialogue in particular is smug and self satisfied. Indeed there was only one character throughout the entire book that seemed warm, engaging and human – Andrew’s father, who appears in maybe two chapters at the most. Having said that, we all of us responded much more positively to the story within the story. The myth of Leda is a horrible one, but Beatrice and her Olivier story was just lovely if somewhat predictable. (Though we did have a giggle at how frequently she thought of his age – not flattering!) We wondered if perhaps Ms Kostova would have been better off writing this as a short story without attaching the cumbersome modern day setting to it. Ultimately we concluded that the book failed to connect to us emotionally – with one or two exceptions. Beautifully written but cold. As one put it ‘You won’t care about any of them but its grammatically perfect’. What a recommendation eh! Some interesting suggestions music wise this month. Mike Oakfield and Underworld being the two that seemed to inspire the most conversation. Read it? What music would you pick? One of the LBC crew made the observation that if this book were a cake it would have been a (redact popular supermarket name here) vanilla Swiss roll – it looks good, but is actually huge and somewhat tasteless. Thanks to the fabulous @WoodsieGirl for the delicious Peanut Butter Cookies. The recipe is now up on the Sweet Tooth Section. For further details, please email me at leedsbookclub@gmail.com or tweet me @LeedsBookClub! And feel free to let us know your thoughts using #WSwanLBC!